Hey guys! This month I was going to go over the second part of genitalia in 3DX. However, we’re saving that for next month instead, and are taking a little side tour. Why, you might ask? Well, in any creative profession there are two important things to know: what to do, and what not to do. The latter is arguably just as important as the former. But we haven’t really looked at things from the “what not to do” side yet. So let’s get into that this month, before we carry on as usual in May. If you want to get into 3DX, or any kind of 3D design in general, you might think the barrier to entry is high. Too high, even. I often get questions from my followers about how much my rendering system cost to build, and how expensive the software is that I’m using. True, at this point in my 3DX career I have made some considerable investments. But I didn’t start out this way. A good 3DX artist can develop their skills and products on a very limited budget. In fact, sometimes the this holds true: a colossal budget does not ensure a quality production. I’ve been wanting to argue this point for a while, but found it hard to come up with a good example. Thankfully, fate intervened with the release of Mass Effect: Andromeda. When it comes to ME:A, I’m well aware of the game’s reception online. There is no shortage of glitch compilations on Youtube, mocking reviews, and Reddit threads full of angry rants. The “my face is tired” sequence is now the punchline to an unintentional joke. Yes, on a budget of around $40 million [Only $40 million? Maybe that’s why it failed  -Ed. 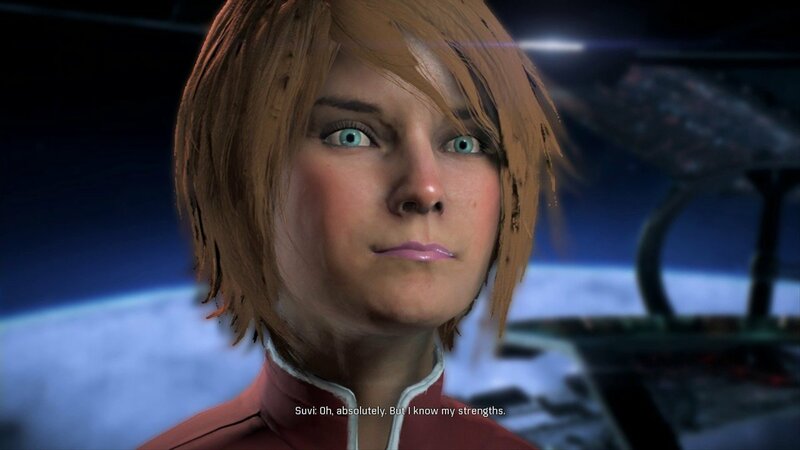 ], Bioware somehow managed to make ME:A’s facial and body animations laughably amateurish. We are all aware. So I would actually like to cover some of the less-discussed flaws of the game’s visual design: texturing, lighting, and shading. First on the list are the game’s texture maps. That’s the color information that is placed onto the mesh to give the illusion of whatever that mesh is intended to be. In the case of a person, it is where the illusion of a person begins. Now, in a game with a lot of aliens you have some leeway. After all, there’s nothing that tells us what alien skin should look like. Or alien make-up. Or aliens in general. So we settle for whatever we see, because there’s nothing to really object to. When it comes to humans, however, problems begin to appear. On the left is Addison, to whom we owe the wonderful “my face is tired” line. And yes, this is what she looked like when she first delivered it. A recent patch updated facial animations, so she doesn’t look quite as dopey anymore, but unfortunately that didn’t solve the other problem. Can you see it? Yeah, exactly. It’s her clownish makeup. 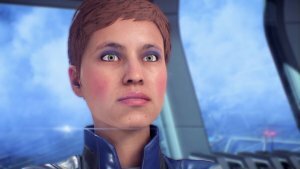 Someone at Bioware thought that the way women applied makeup to their face was to just smear it on. No regard for color, no regard for tone. Just cake red blush and purple eyeshadow onto your skin and it’ll work out. It serves to establish her as a cartoon character just from looking at her. So when she also starts mouthing goofy lines she’s a lost cause for the rest of the game. She has no credibility. Everything she does begins to induce laughter. Think it’s just her? Nope. Outdoor lighting is Frostbite 3’s forte. 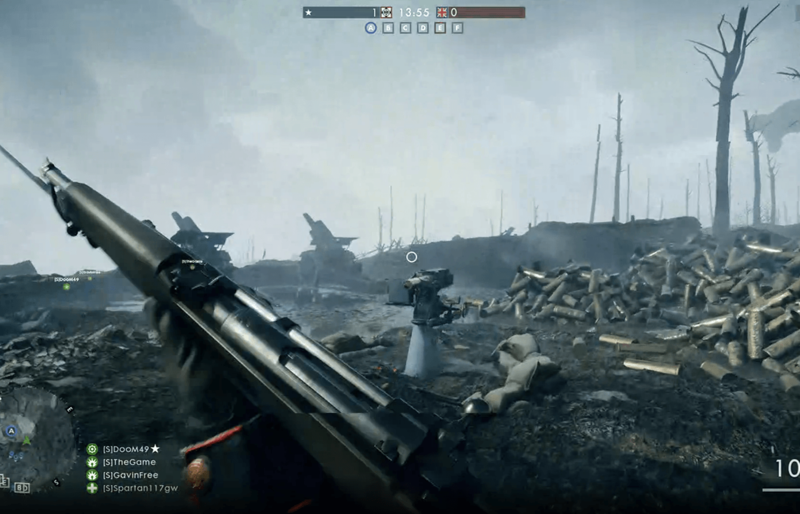 And certainly in the hands of DICE, who developed the engine, Battlefield 1 manages to look more amazing than a Battlefield game has ever looked. Now being part of the EA family, Bioware has access to this same engine. And certainly, ME:A’s outdoor visuals are great. But any 3D artist can attest to outdoor lighting being the easiest. If your texturing and your shading holds up on simple objects like rocks, sand, mud, metals, and so forth, it’s not hard to light the scene. Configure a sun and a time of day, and the engine will mostly take it from there. Alternatively, an HDR map can do most of the work for you. Certainly, many developers will choose to augment outdoor scenes with additional light sources. Glowing plants, building lamps, lava streams, there are great ways to add additional depth and life to an outdoor environment. But what happens when you place a person under those same lights? This takes us back to the point above: if your shading is wrong, no amount of lighting can save it. Which means that in the hands of Bioware, a great engine like Frostbite 3 becomes like a fancy racecar driven by an old lady. One recurring problem with Mass Effect: Andromeda is that skin just doesn’t look like skin. Everybody is either coated in a thick layer of grease, or looks extremely dried out. There really aren’t any in-betweens. Again, more leeway for the alien races here, since we have no frame of reference. Suspension of disbelief is more easily reachable. But we know what human skin looks like. We know how it interacts with light when it’s wet, when it’s dry, when it’s oily, you name it. And Andromeda’s human characters come out looking like animated wax dolls. For example, to the left is a still from male Ryder’s romance scene with Peebee. It’s an image that suffers from two clear problems. The first being poor lighting (there appears to be only one light source, which gives everything a very artificial, flat look), and the second being skin shading. Look at the way light interacts with Ryder’s skin. Is that how a human looks? If you saw this image and never heard of Mass Effect before, but you knew the Frostbite 3 engine, you would not say that it took Frostbite 3 to accomplish this. 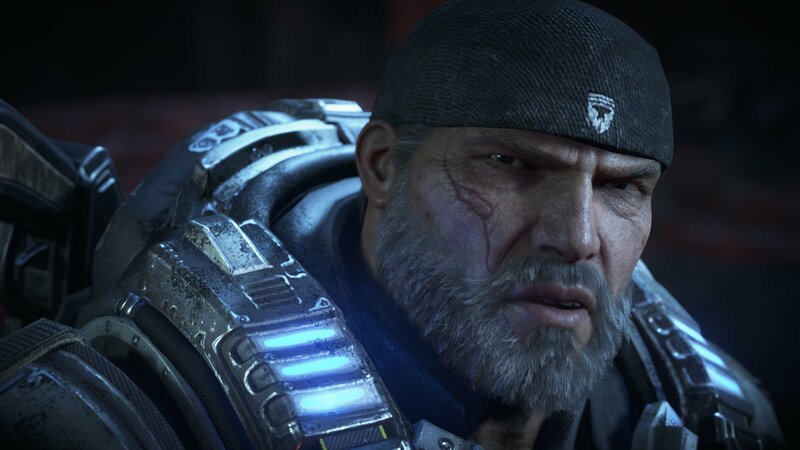 Unreal Engine 3 could’ve done this in 2006. Any free render engine like Blender’s Cycles render, Daz Studio’s 3Delight, or Poser’s Firefly could’ve done this. And much better, too. Images like this litter the net. 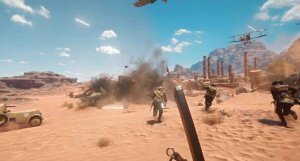 How is this from a AAA game? I understand developers have to make some concessions. It’s a game engine, not a dedicated render engine. It works with fewer polygons, more limited texture resolutions, and so forth. It also works with baked lighting a lot, which means pre-calculated lighting effects in order to reduce the engine’s legwork during play. And that’s all fair enough. But to the right is what The Coalition achieved with Unreal Engine 4, which Frostbite 3 certainly does not need to bow its head to. It’s the holy trifecta of realism: good texturing, spot-on shading, and strong yet nuanced lighting. In fairness, we have to admit that Mass Effect: Andromeda was designed by Bioware’s secondary studio in Montreal, not its main studio in Edmonton. So maybe that had something to do with it. And also in fairness, there have been plenty of good games where graphics are poor. So it’s not an immediate disqualifier. But in the defense of those games, they also do not run on Frostbite 3. 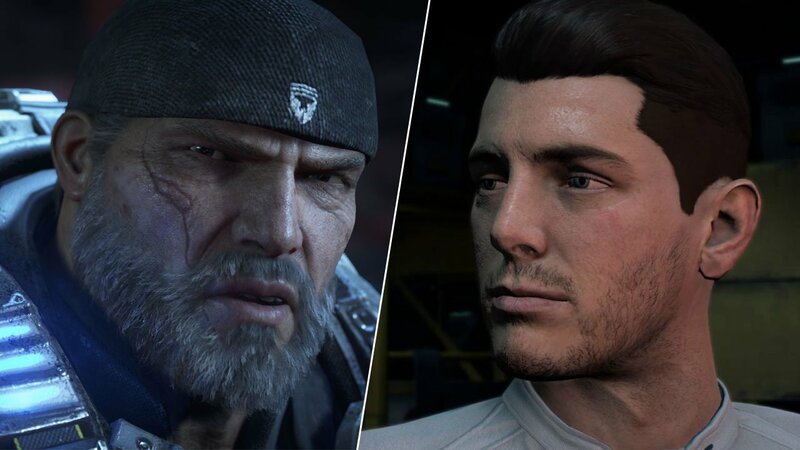 Deus Ex: Mankind Divided gets more slack from me on character graphics because it has less to work with. Comparatively, it then accomplishes more. Ultimately, this article isn’t a review. It shouldn’t discourage you from getting ME:A. If you’re a fan of the series and enjoy what it has to offer, by all means go for it. I have fapped to less-than-great looking 3DX. Instead, what I hope I highlighted was that money doesn’t buy talent, nor a guaranteed good end result. Visually, ME:A is an underwhelming game. The home runs it scores visually are built on the inherent strengths of the engine, and the work that the magicians at DICE worked for them. It is precisely whenever Bioware needs to apply its own touches that their knowledge of Frostbite 3’s fundamentals comes up short. They had so much to work with, and accomplished so little. It may be an EA flagship title, but I have much more respect for small-time artists who achieve great things on shoestring budgets. The 3DX industry is full of them, and you could be among their ranks. Which is a great note to end on. See you next month! This is a good article, I am always impressed by people that can work with so little. The people at Affect3D, man you guys rock. Consistently putting out good content, which is why I have bought some. Like you said talent and dedication vs Bloated budget. When you work on something you care about it shows and everyone that sees your works acknowledges that. That is a double-edged sword as well. As in Mass Effect: Andromeda, such a lack of effort and disregard for human character models. It’s why I am fascinated by the renders here on this site and keep coming back, the consistent quality you guys put out. I’ve hovered reading most of what you make since its interesting. this might be tedious as fk but anyways.